Indoor plants can be a wonderful contribution to the decoration of a home. There is no cheaper way to produce them in greater variety or more copiously than from seed. The only drawback is that usually we do not know how to restrict. Indeed, some enthusiasts sow enough seed to supply a nursery. What eg with 120 Rex begonias, so just want 2 plants? Therefore planting fewer seeds. Germination depends on temperature control, humidity and light, although it is not necessary, as regards the plant's environment, constantly check with a thermometer and other instruments. The temperature of seed germination should be 10 degrees higher than that required for normal growth of the plant. The use of a heating cable in the bottom of the pot or tray, or a miniserre provided this element promote rapid germination and growth. Basic equipment Place the container in a warm bright enough, or near a sunny window or under artificial lighting (fluorescent tubes horticultural). The equipment needed to start seeds is both simple and inexpensive. Get a small amount of mixture for planting without soil or vermiculite or peat moss. Dampen a little of this material applied in a pot, a bowl or tray. Sow one seed per container species, since all the seeds will not germinate at the same pace. This will avoid disturbing the plants by removing the slower ones whose germination is faster. Peat pellets One of the most effective ways, if not the best, make the planting is the use of peat pellets that are a combination of pot and peat moss in a unit to a compressed seventh of its thickness. Just sprinkle a disc to get a pot of 4 cm (1 / 4 ") diameter by 5.5 cm (2) * e) high. These records are complete, that is to say they contain enough nutrients for rapid plant growth. They provide seed quality, well trained and free of disease while avoiding the problem of transplant and the transplant. Pressed peat pots are also very useful for starting seedlings. When the time of transplantation, simply place the pot that is biodegradable in a plastic pot or earthenware, without disturbing the plant. Regardless of the container used for planting, except miniature greenhouses, gender Merrigro example, it is necessary to wrap it in a plastic bag, then install it in a well lit. It is also important that there be heat in the container. The humidity inside the bag is to be monitored if it is exaggerated, aerate. The germination medium should be kept slightly moist at all times, either by light watering, either by spraying with water. Upon the occurrence of stems, fertilize with a complete fertilizer solution or formula 20-10-20 for plants or tropical plants grown for their foliage or 10-30-20 formula in the case of plants flowers. 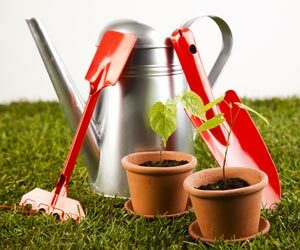 Case of green plants or flowers, it is necessary that the fertilizer is quite low, namely between 1/8 to 1/4 of the recommended concentration for adult plants (in 1/8 1/ 4 teaspoon of fertilizer per liter of water). When you start fertilizing seedlings (seedlings), remove from heat in the container, bowl, tray, pot, etc.. The seedlings should then remain surrounded or wrapped in a plastic bag for 2 to 3 more days. When 4 true leaves have been formed, transplant the seedlings into individual pots. Case of seedling parts on disks in biodegradable peat, eliminate the weakest seedlings and place each disc or pot in a peat pot individually. Because this website is free to use we need some financial help to make it run and to advertise so you receive more ideas for your garden please suport us here: donate link - it will be a great aid and will be appreciated.